Wed., May 25, 2016, 5:44 p.m.
HONOLULU – Dozens of Hawaiian Airlines pilots picketed Wednesday for a new collective bargaining agreement a week after voting to allow union representatives to call for a strike if necessary. The pilots gathered outside Honolulu International Airport. Hawaiian Airlines said in a statement that the union is asking for a 52 percent increase in total compensation in the first year of the contract. The value of that increase is $74 million for a workforce of roughly 600, the statement said. Any strike called by the union would have to be allowed by the federal government. The Air Line Pilots Association said 99 percent of Hawaiian Airlines pilots who cast ballots favored allowing union representatives to call for a strike if they feel it is necessary. Meanwhile, the union recently allocated $2 million to pay for strike-preparation efforts. Davis said a strike likely wouldn’t occur before mid-July. Over the past few years, Hawaiian Airlines has made record profits and its share price has risen almost 500 percent, the union said. Pilots, however, are paid about 45 percent less than their peers at other airlines such as American or Delta, said Capt. Hoon Lee, chairman of the Air Line Pilots Association unit at Hawaiian Airlines. 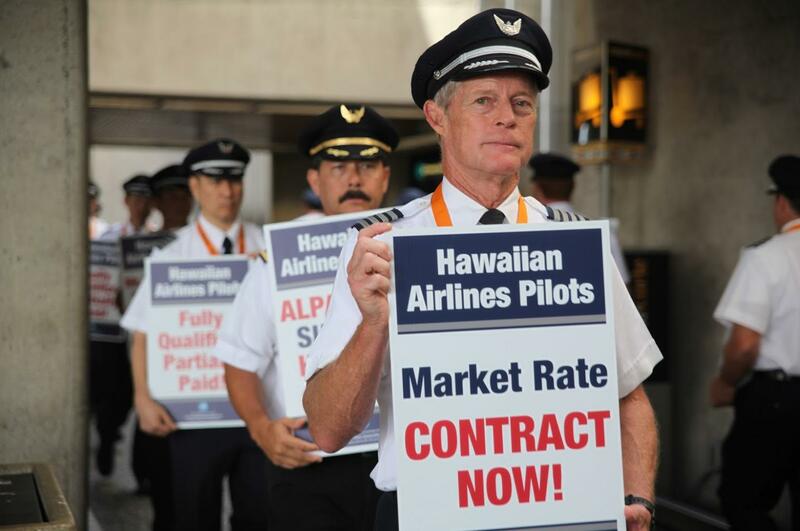 “In this record profit environment, which all of the employees here at Hawaiian have been integral in the success, it’s shameful that the company choose not to offer profit-sharing to the pilots,” Lee said. The airline said their pilots are well compensated. For example, a pilot with 12 years of seniority in the company earns an average of $242,000 a year for flying for 700 hours. They also get benefits such as medical coverage for life for retirees and their spouses, and the company contributes between 15 and 19.4 percent annually to the pilots’ 401(k) plan, the statement said. Before a strike could occur, the National Mediation Board must decide against mediation efforts and then offer to arbitrate the dispute. If either side declines arbitration, they enter a cooling off period, with union members able to strike 30 days later. Published: May 25, 2016, 5:44 p.m.